Another legend associated with Akshaya Tritiya (Akha Teej) is set in the epic of the Mahabharata. Mahabharata is the story of the epic battle between the Pandava princes, who stand for Good and their cousins, the Kauravas, who stand for Evil. The five princes were robbed of their royal inheritance which they gambled and lost in an unfair game of something very like the modern chess. When the Pandava princes were exiled into the forest along with their young bride and their aging mother, they could not find enough food to feed themselves, as they were unaccustomed to living off the forest. Lord Krishna, taking pity on their sorry plight, presented Draupadi, who was wife to all the Pandavas, with a magical bowl that would always stay full. This magical bowl carrying an unlimited quantity of food was known as the Akshaya Patram and it is believed that Krishna presented this gift on a Tritiya day. Like the food in the Akshaya Patram, it is believed that all investments made on this day will have an unlimited increase in value. It was also on an Akshaya Tritiya (Akha Teej) day that the Pandava princes unearthed weapons that would guarantee their victory in battle with the Kauravas. Another legend which people relate to Akshaya Tritiya is about the Kanakadhaara Stotram. Once Adi Shankaracharya went to a lhouse for alms. There was a poor lady all alone in the house and with no food in the house to be given to him in alms. She frantically searched the house and found a Gooseberry(Amla/Nellika). and she gave it to him. 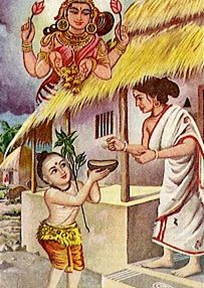 Adi Shankaracharya was very pleased at the ladys willingness to donate the only piece of food she had. Adi Shankaracharya immediately recited the KanakaDhara Stotram and invoked Devi Mahalakshmi. Devi Mahalakshmi was pleased and she showered the lady’s house with Golden Gooseberries. This incident is supposed to have happened on Akshaya Tritiya Day. It is thus said that little acts of charity/donation done on this day with bring in manifold returns. Akshaya Tritiya which falls on May 13th is one such momentous occasion, which is considered one of the most auspicious days of the Hindu Calendar. It is believed, any meaningful activity started on this day would be fruitful. Lord Krishna, an avatar of Vishnu, the God who carries out the work of sustaining the universe, figures prominently in most stories about the origin of Akshaya Tritiya. Of these, the most famous one is, perhaps, that of Kuchela, also known as Sudama, and Krishna. Kuchela was a poor Brahmin and a childhood friend of Krishna. A time came when he was in dire straits and could not earn enough for his family. So he decided to go and meet his former school mate who was now king of Dwaraka and ask for some financial help to tide him over. Before setting out on his journey, he packed a handful of poha or aval (beaten rice) as a humble gift for his friend, the king. When he reached the palace, Kuchela was mesmerized by all the wondrous things that he saw and felt ashamed to offer his gift that he felt was definitely unfit for a king. Krishna was very happy to see his childhood friend. He welcomed Kuchela with open arms and treated him like a god, following the age-old Indian dictum that ‘The guest is god’. He happened to see the packet of beaten rice that Kuchela was hiding and playfully grabbed it, opened it and began to eat the poha with obvious enjoyment. When he saw this, Kuchela was so overcome with emotion that he forgot why he came to see Krishna. After spending some joyous days with Krishna at the palace, Kuchela began his long walk back home. During the journey, he suddenly remembered that he had failed in his mission and walked home with a heavy heart wondering how to console his waiting wife and children. On reaching his village, Kuchela found a palace where his hut stood, and inside the palace, his wife and children clothed in the finest of clothes. Food fit for royalty was also laid out on the dining table. Kuchela realized that this was a miracle performed by the divine Krishna, who had many fantastic powers that he wielded to help each and every person who approached him with a problem of any sort. From that day on, the day that Kuchela met Sri Krishna was observed as Akshaya Tritiya (Akha Teej) day.